As we all know, the wallet is one indispensable item for most individuals. You can put money, cards and important receipts inside. 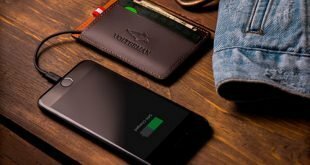 And when getting into the competition, each wallet brand defines themselves in the market by adding unique and helpful functions. For instance, you can carry your smartphone, pen or checkbook when going out instead out those slim cash, credit – debit cards. But have you ever heard about the combination of best keychain wallet and roomy space for essentials? Selecting the Best keychain wallet will give you opportunities to go through this fantastic feeling. What is more awesome than carrying bunches of thing, even your keys without worrying about the loss of items. No more digging at the bottom of your bags to finds keys in case you are in a hurry. The very first one defines its prestige as one key case of Rustic Town – one famous brand for genuine leather item. This Slim Compact Leather Key Holder Wallet is available in 2 color tones: brown and dark brown. 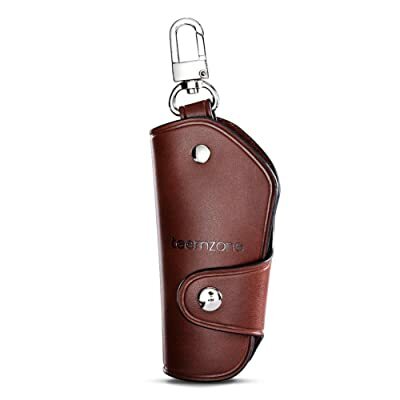 Take advantage of Genuine Buffalo Leather, key chain holder delivers the durability and long-lasted lifespan. If your fashion style belongs to the vintage group, then this key case is a good option. Its size is compact to put inside pockets and bags (10.5 x 7.0 cm – Length x Width). Highlight tri-fold design, the key covers contain 2 extra pockets for money and cash. You can bring up to 6 keys with 6 separated clips. All your essentials receive the high protection when having the heavy duty button closure. Apart from the genuine leather, glossy stitched seam is the element highlights its appearance. When buying, make sure you check the embossed Rustic town logo for the real authenticity. When putting more keys inside, you will find it harder to carry them inside your back pocket. 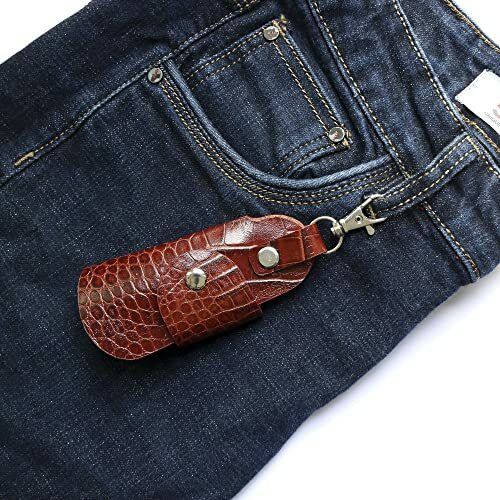 Now, if you want to be outstanding with a one-of-a-kind key holder, make yours a plot twist with this crocodile embossed genuine cowhide leather model. This is also a brand-new product line of Lethnic that’s perfect for car key holders (I mean any kinds of car keys). 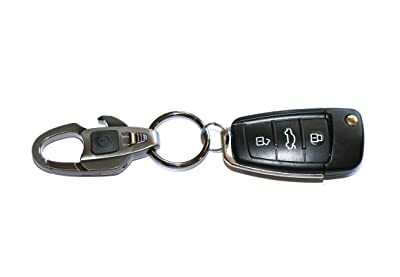 Yeah, you don’t need t worry about the size because this model is designed with pyramid shape in opening style to ensure it fits car keys of any brands. However, it still keeps your keys in place and look neat thanks to the attached snap button. It’s also very easy to use and to store or to hook to somewhere because aside from the leather piece, there’s a sturdy stainless-steel belt or purse hook. 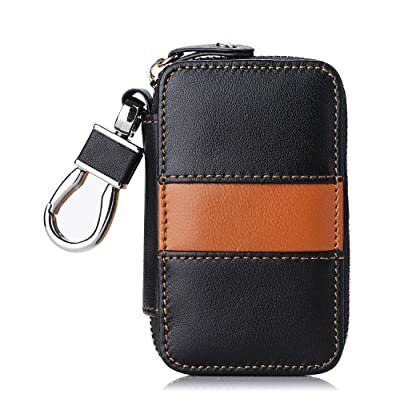 And don’t worry, similar to the leather material, the hardware of this key holder is made out of premium weather-proof metal to keep itself last with time. Pick it, you will receive three biggest benefits: convenient, compact and luxury vibe. In additionally, there’re a lot of other benefits like various color options, reliable warranty and beautiful packaging. In briefly, there’s no reason to not give it a try! For people who divide their essentials into separated items when traveling, we suggest you are more likely to choose this one. 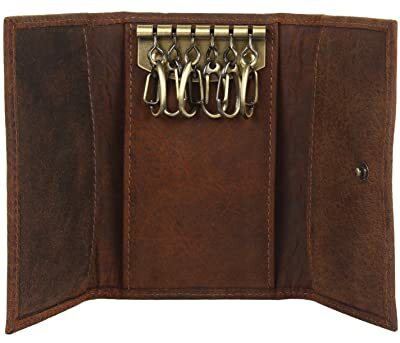 Men Leather Zip Around 6 Hook Key Case offers roomy space for all keys; while you already have one wallet for cards, cash and papers. Use leather, wallet delivers the durable use and firm construction to put anywhere you want. For those who wonder about sizing, this best keychain wallet measures 4.33 x 2.36 inches. You can choose to carry on hands, put inside bags or pockets depend on habit. When opening, there are 6 key hooks, a big removable key ring, and one electronic key ring. You will also find 2 extra slots for debit/ credit cards. 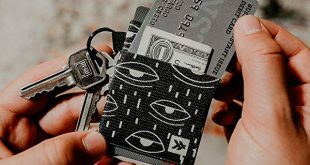 Best keychain wallet gathers roomy space for your essentials. However, there are customers state that actual product is too big for the pocket. Do you love Aladdin movie of Walt Disney? If you still feel nostalgic about this movie, grab this Aladin Womens Leather Key Case as one unique accessory. Make of genuine cowhide leather, material delivers the compact and warm feeling when carrying on hands. Available in small size measures 4.9 x 3.4 x 0.5 inches, feel free to put inside front – back pockets or small purse. Highlight itself as one best keychain wallet; you will come across 6 metal hooks to keep keys and tiny essentials well-organized. The Aladin key case performs as one small purse as well. There is an extra zipper pocket for coins, a compartment, and one key ring. Since this is an imported product, zipper and keychain take advantage of golden metal and heavy duty component. The actual size of the item seems to be a bit bigger than the mentioned sizing. Overall, this Aladin is great when offering both spaces for money, cards, and keys as well. For people who invested such large amount of money in one exclusive car, we sure you don’t want to miss its key; even other accessories related to this. 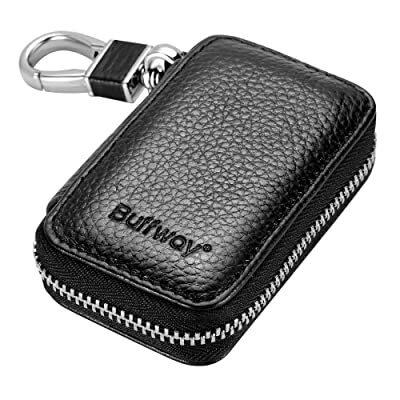 Buffway Car key case, Genuine Leather Car Smart Best Keychain wallet is an ideal option. Focus on the exotic material, it delivers the smooth feeling within one touch. Best keychain wallet features a combination of 3 inner layers including microfiber, molding plate and shock-proof sponge. Kindly check your key size to make sure it fits the dimension (3.34 x 1.96 x0.78 inches). No more worry while your key receives the high protection thanks to one smooth zipper around and a Kirstine hook. Although the sponge layer secures thing from outer impacts, you need to keep it away from high temperatures, rain as well. Purchasing this one means you will receive a 90-day free replacement in case you are not satisfied with the item. Be careful when using as you may damage the keychain and zipper. According to some customers, these elements present low quality of the material. Actual size appears to be bigger. Vote for masculinity but vintage fashion style? Teemzone® Unisex Leather Individuation Key Chain Holder Case is finding its way coming to you. Make of top-grain cowhide leather, material delivers the compact and warm feeling when carrying on hands. After going through the strict process of polishing, oiling, and waxing, we sure you will get attracted by the vintage and nobly outer skin. The longer you use , the more retrospective it appears. 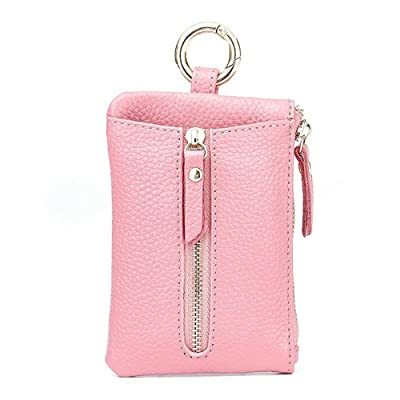 This best keychain wallet ensures to fit all pocket with sizing measures roughly 11 × 5.5 × 2 centimeters. Feature the keychain and metal clip; you can put up to 6 keys. Yet, please remember it is suitable for small keys or door key, not the bigger one. One more button closure makes of heavy duty metal to emphasize the absolute protection. Best keychain wallet appears to have the slight natural odor at first, please keep it in a ventilated area in a couple of days. Fantastic !! This leather key holder receives mostly compliments for the vintage design and excellent materials. Leather wallet for men does not have to be bi-fold, tri-fold or long construction all the time. FYY Car Key Chain Bag as one best keychain wallet would be a great item when adding to your collection. 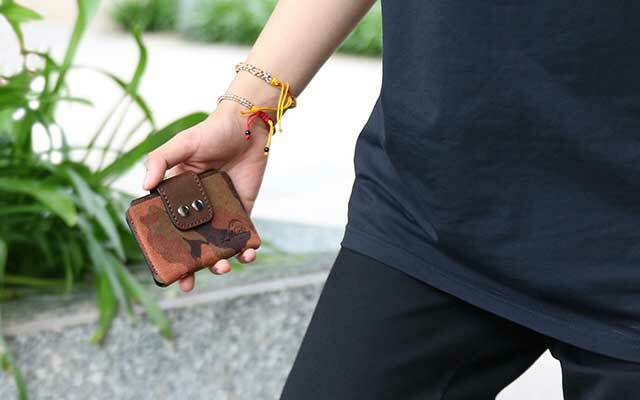 Make of 100% genuine leather, wallet delivers the awesome and durable feeling even from the first touch. Highlight the perfect craftsmanship and firmly stitched seams, they even make the key case more durable. 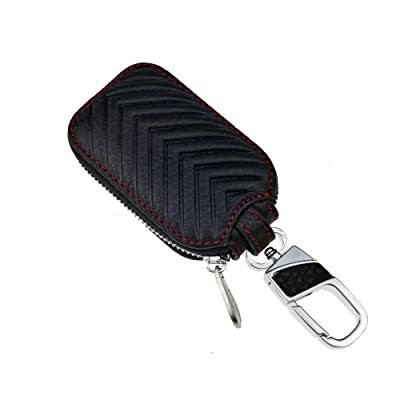 The leather key holder measures 3.5 x 2.1 x 1.1 inches, which is suitable for car key fob and alarms. For the inner design, you will find one key ring and keychain, sure to meet all your purposes. No more worry while your key receives the high protection thanks to one smooth zipper around. Although the great material secures thing from outer impacts, you need to keep it away from high temperatures, rain as well. Wallet receives mostly compliments for the excellent material. Also, you will find its design masculine and compact to carry all over the places. 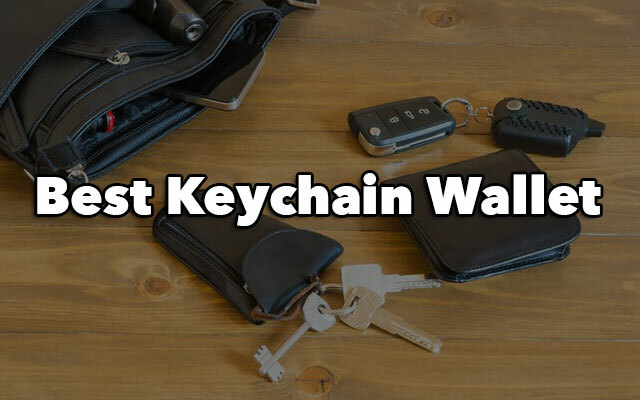 While people are seeking for the best keychain wallet, there are still some prefer using the keychain separately. This seems to be more compact. Maycom Retro Style Simple Strong Carabiner with its strong design desires to hook all your things. Take advantage of chrome plated alloy, it brings the long-lasted lifespan. 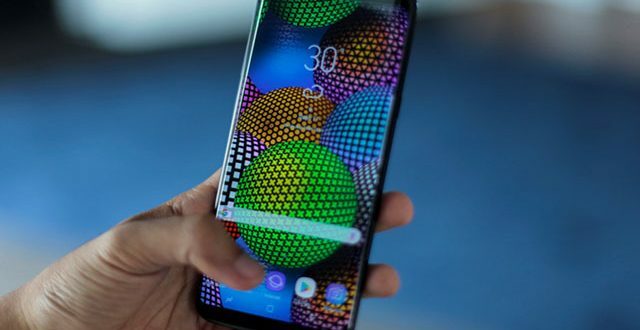 You will also find one layer of high-grade polish that highlights unique design and prevents the item from bending, damaging from outer impacts. 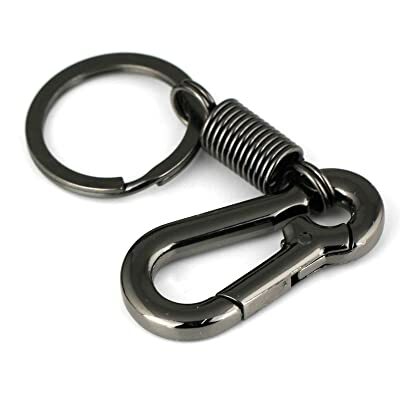 This 3D Miniature Carabiner Shape Key chain holder is useful for different types of key. There are 2 separated key ring and key loop. Individuals can both attach their key and also attach the key chain on their belt loop. In case you are not satisfied with the item, this piece comes with a full 12-month warranty, and a 14-day money back guarantee. For every keyring or best keychain wallet, kindly measure your items to avoid inconsistency in sizing. If sizing is your top priority when purchasing, check carefully. We are so excited to suggest one simple and best keychain wallet in both design and material. 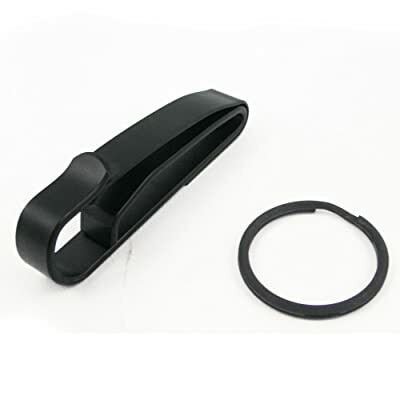 Check out this Zak Tool Key Ring Belt Holder – No. 55! Take advantage of black powder coating, it brings the long-lasted lifespan. You will also find one layer of high-grade polish that highlights unique design and prevents the item from bending, damaging from outer impacts. This one design gives you an easier way to grab item and essentials. Key covers suitable for duty belts up to 2¼” wide. There are 2 separated key ring and key loop. Individuals can both attach their key and also attach the key chain on their belt loop. Since this key case makes use of heavy duty material, you will find it hard to squeeze when you want to take keys out. Although there are still 18 key covers left in stock, you need to HURRY NOW if you really interest in this one. Mehr Classic Attachable LED Flashlight Key Chain stays on top of the list for many recommendations and high ranking. Take advantage of chrome plated alloy, it brings the long-lasted lifespan. You will also find one layer of high-grade polish that highlights unique design and prevents the item from bending, damaging from outer impacts. As saying, measure your item to make sure it fits this dimension 3.5 x 1.5 x 0.25 inches (including the ring). You can use this one for multiple purposes including bottle opener, belt hook or LED flash light. If you are seeking for one special gift, Mehr best keychain wallet presents one elegant package. AS advised, it is better to pay strict maintenance to prevent the glossy lining from fading away. KUMEED Car Key Chain Bag Key Chains is preferred by most customers thanks to the variety in design and color. Make of high genuine leather, wallet delivers the soft and durability even from the very first touch. 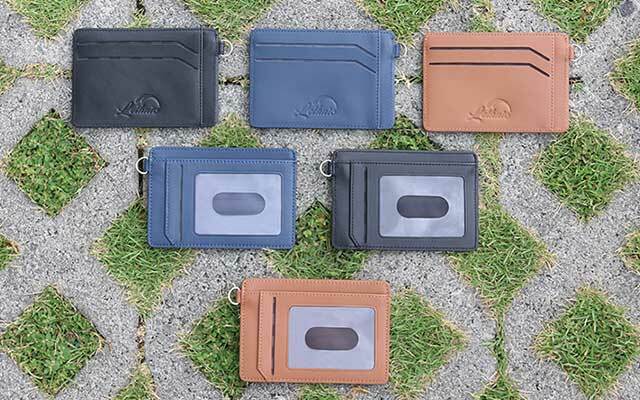 Best keychain wallet features a combination of 4 inner layers including microfiber leather, fastening, cow hide, and precaution. The exterior size of this key case measures L 3.3 x W 2 x H 0.8 inches. Therefore, it is better to pick up this one if your key is about 3.28 x 1.8 x 0.8 inches. Leave out roomy space; you can put money, cards and small essentials without a burden. 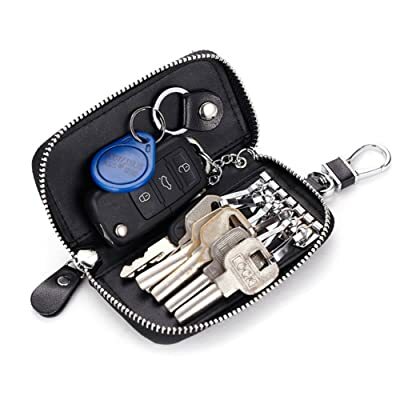 Do not underestimate this key holder wallet, it meets several purposes including remote starter or car fob. Above are some best-seller of best keychain wallet. They ensure to adapt strict quality, elegant performance and excellent material. The fantastic thing is that you can also use them for several purposes as well.